Since the game of baseball is played outdoors, it stands to reason you will play in the rain from time to time. A little rain won't harm the soft leather of your baseball glove, but when you leave your glove outside in the rain problems can occur. A soaking rain can wash away protective oils, damage the leather and weaken the laces. Despite these problems, you can get your glove back into game shape quickly. Blot the baseball glove with a towel to remove as much of water as possible. Don't rub from side to side, as that will only make the situation worse. Allow your baseball glove air dry at room temperature, according to BaseballGloves.com. Let it to dry on its own schedule, and refrain from putting it in the oven, microwave or clothes dryer. If you need it quickly, it is OK to run a hair dryer over it, but be sure to keep the dryer moving. Wait a few days for your glove to dry thoroughly before you think about using it. Once it is dry, apply a thin coat of glove oil or conditioner to help bring the leather back to the condition it was in before it got wet. Place a baseball in the pocket of the glove and wrap a rubber band around to secure it. Store it in a dry, cool place, and leave it until you need to use it again. 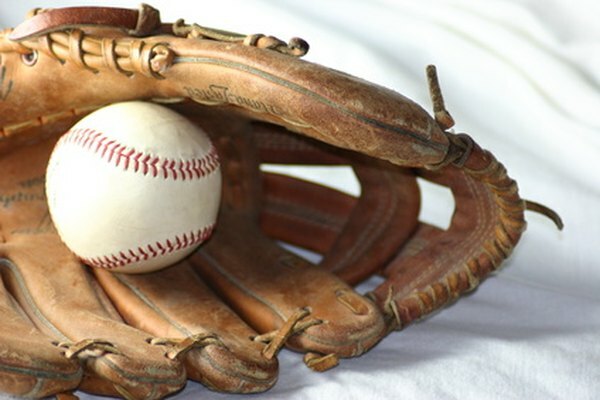 About Baseball: How Do You Dry a Water Soaked Leather Baseball Glove?